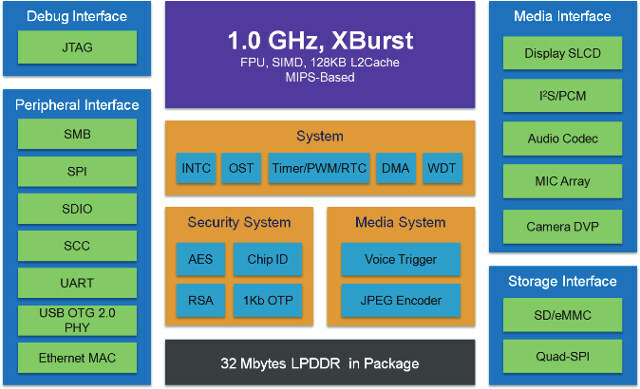 Ingenic is a Chinese SoC vendor that makes processors featuring their X-Burst cores based on MIPS architecture. Their JZ47 series can be found in tablets and development boards such a MIPS Creator CI20, while their M series, including Ingenic M200, are dedicated to wearables & IoT applications. The company has now launched X series starting with X1000 processor which include an audio codec, a Voice Trigger Engine (VTE) and 32MB RAM in package. The processor is said to support “Linux 3.0 OS and greater”. 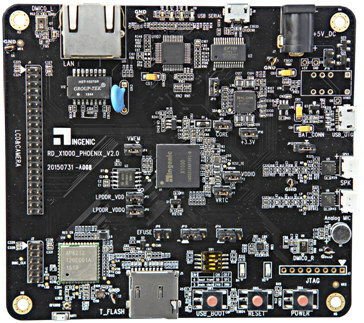 Ingenic also developed X1000 Phoenix evaluation/development board with X1000 processor, 16MB SPI NOR flash, 802.11 b/g/n Wi-Fi and Bluetooth 4.0 (AP6212), a micro SD slot (up to 32GB), an Ethernet port, a micro USB OTG port, a stereo audio power amplifier, 3 microphones (2 digital, 1 analog), as well as an expansion header that supports display and camera interfaces, a “payment” interface, and Zigbee. The board is powered by a 5V/3A power adapter, and also features a JTAG connector for debugging. I could not find details with regards to pricing and availability. You may want to visit Ingenic X1000 product page (Chinese version) for some more information in both English and Chinese, at least until the company decides to complete the English version. Thanks to Frederic, Victor and José for the tip.